Sportpesa CEO Ronald Karauri must be thanking the heavens that comedians Propesa were not travelling in his Range Rover Overfinch. This is after the popular Kalenjin comedians were involved in a road accident that saw their Probox turn on its head and land in a ditch. Details about the crash remain scanty for now but the good news is that the comedians escaped unhurt. Propesa took to social media on Monday to break the news saying they thank God for surviving the crash. “Got involved in an accident. Thank God everyone came out fine,” they captioned a photo of their overturned vehicle. In the comments section, Propesa added, “we are okey”, as their fans condoled them. 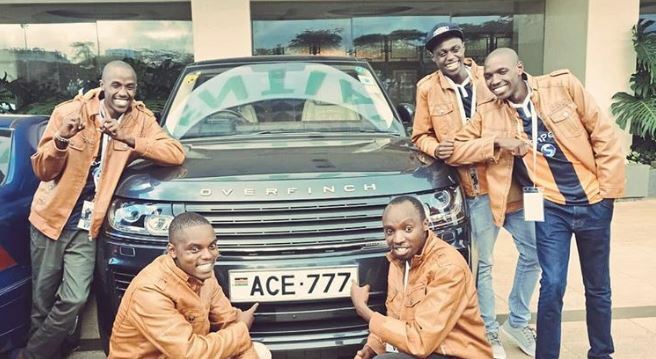 A few months ago, Propesa were cruising around in Karauri’s expensive SUV after winning a bet when English side Hull City came to town to lock horns with Kenyan Premier League giants Gor Mahia. Propesa have since entered into a new bet with Senator Murkomen for Gor Mahia’s clash with Everton at the Goodison Park stadium in Liverpool, England.